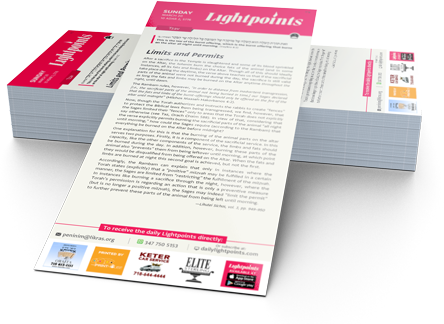 Light-Points is a project of Machon Ohr Hachassidus, an organization founded thirteen years ago with the goal of making the Rebbe's Torah insights accessible and available to the broader Jewish community, layperson and scholar alike. In 5764, in response to the demand for easy-to-read but authentic representation of the Rebbe’s teachings for the English-speaking community, and at the encouragement of Rabbi Zushe Wilhelm, dean of Mesivta Oholei Torah in New York, Machon Ohr Hachassidus launched Light-Points. Light-Points are short selections from the Rebbe’s teachings relevant to the weekly Torah-portion or the holidays. These meticulously selected Divrei Torah, adapted into English and reviewed for publication by a dedicated team of editors and scholars, are released every weekday in both print and email. The print edition is distributed in Shuls and stores all across Brooklyn, Lakewood, Monsey, and other major Jewish communities in the NY area, and the daily emails are delivered to approximately 20,000 subscribers and growing. From the businessperson looking for some inspiration before starting the day, to the schoolteacher who wants to spice up her Chumash class with the Rebbe’s novel approach to the topic that she is teaching, the Light-Points are enthusiastically received by thousands of people from all segments of the international Jewish community. Join the movement today and subscribe to receive the daily Light-Points in your inbox each morning. Be a part of this monumental project by dedicating a week or a day of Light-Points in honor of a loved one or a special family occasion. With sincere thanks to Rabbi Zushe Wilhelm, who initiated this project, and whose vision and unwavering support have been a driving force in seeing it through from dream to reality.